I am not going to write a lot about the following which is a pictorial guide to what is available. This is actually a silk rather than a card. 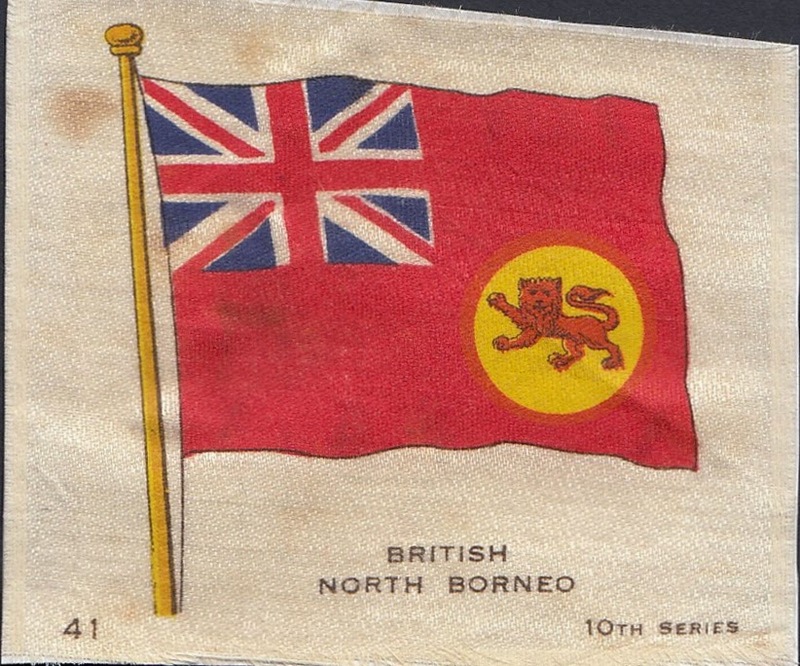 I have other examples of Brunei and quite a few of the Malayan States. I am not showing them here as there is already quite a bit to see further down and silks are too delicate to handle. 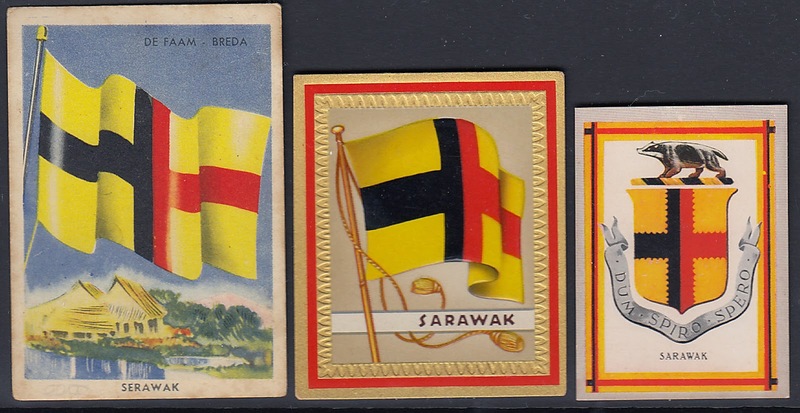 A trio of Sarawak cards from N V De Faam Breda, Aurelia and York cigarettes. The first 2 embossed cards are from Aurelia and the third one from York cigarettes. The first one is from Massary, the second from Bulgaria cigarettes of Dresden and the third from Kosmos which were all German brands. A trio of embossed Aurelia cards. Again we have Aurelia cards from Germany. A few more but there are probably some more to complete this particular series. Firstly, wishing everyone a Happy Chinese New Year. The Chinese lunar New Year of the Goat starts today. These posts on cigarette cards do not seem popular but I am plodding on and will use these pages for my own future reference. 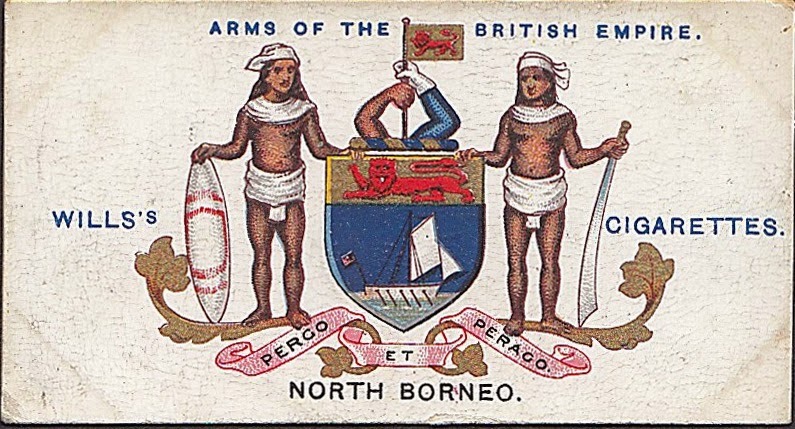 I am please to own what seems to be a very comprehensive collection of cigarette cards of North Borneo and allied territories. The following are British in origin. They include some of the most attractive designs seen for these old cards. 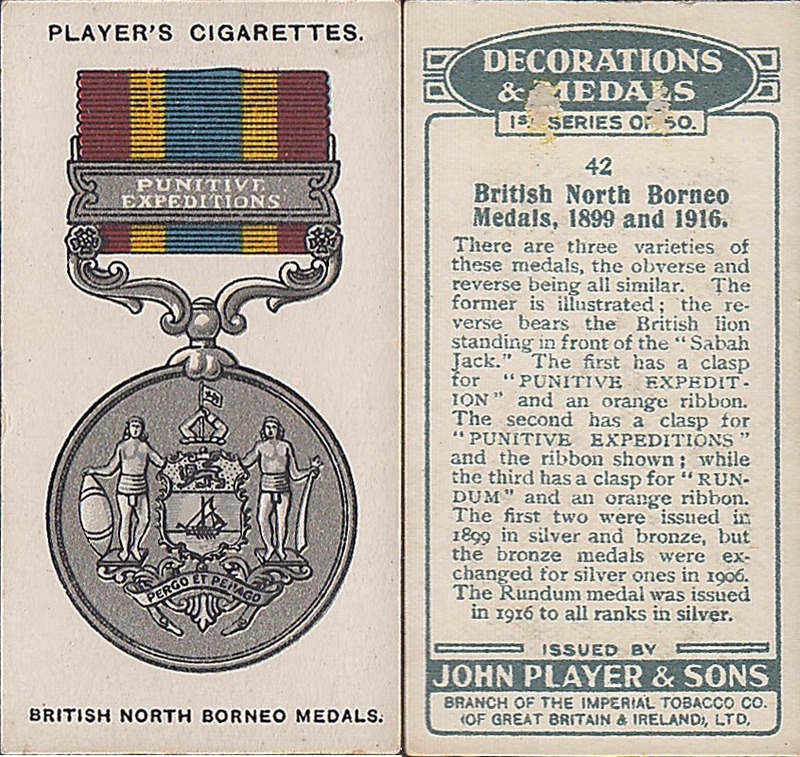 Players cigarettes which was mainly based in Nottingham GB issued 2 series depicting medals and medallions. 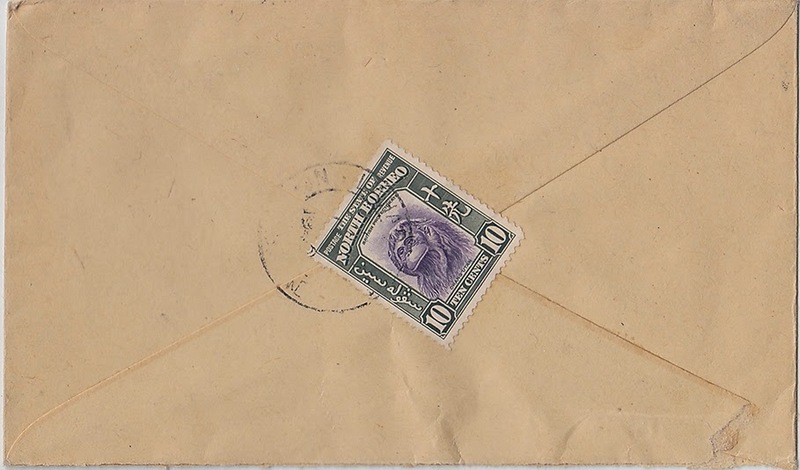 These 2 were from the first series of 50 circa 1912. The second series of 90 cards had no representation from BNB so far I know. The back of the card gives a very good description. 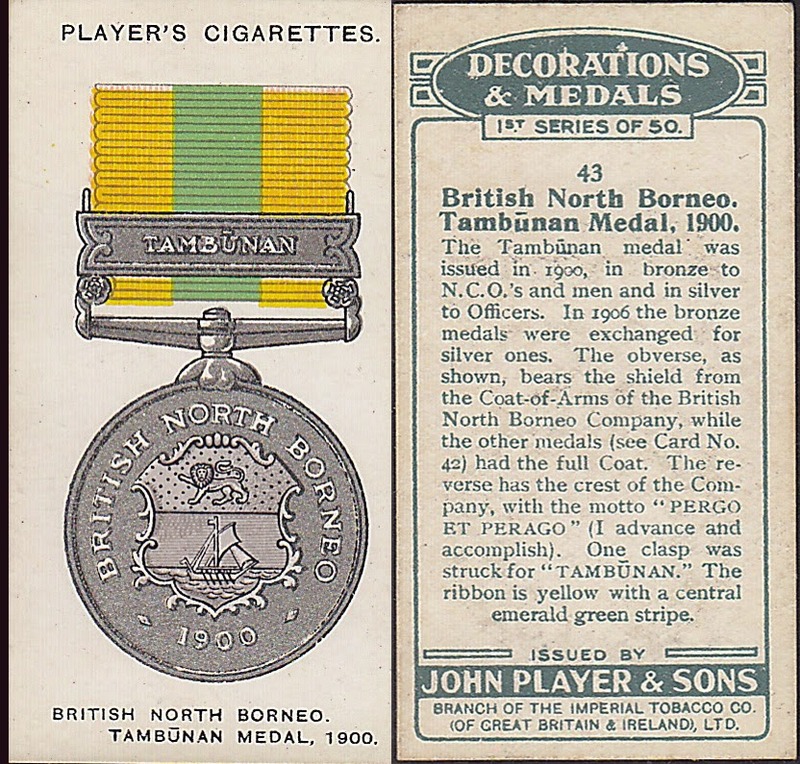 This is the Tambunan medal for 1900. It is interesting to find the company motto of Pergo et Perago has been interpreted as I advance and accomplish. This is the punitive expedition against Mat Salleh in Tambunan which led to his demise and was the beginning of the end of the rebellion. 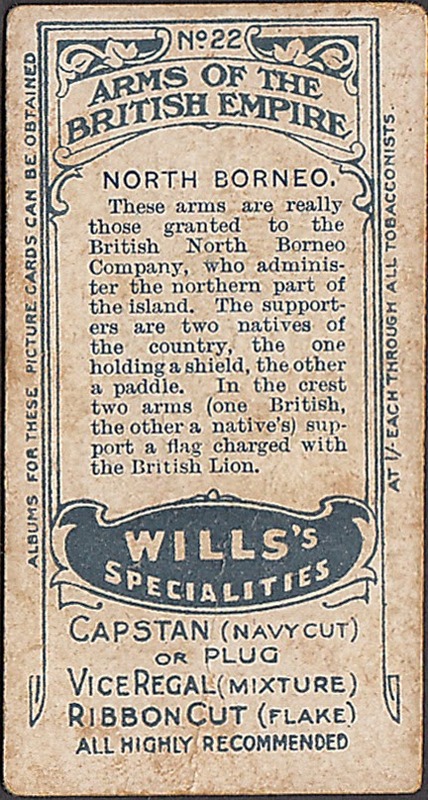 There is more than meets the eye with this particular card from Will's cigarettes which was part of Imperial Tobacco. I bought another 2 versions from a local fair recently. Looking at the back, I realise thee are some differences. I think this version 1 is earlier than version 2 with a slightly different format in black on the back and no writing on the side. Version 2 has the back in blue print and also the two side advertised albums available for sale to store these series of cards. These cards were issued around 1910. The front of this card was poorly set up for printing and the lettering is in black instead of blue. This should have been later than version 1 with the extra advertisement on the side. 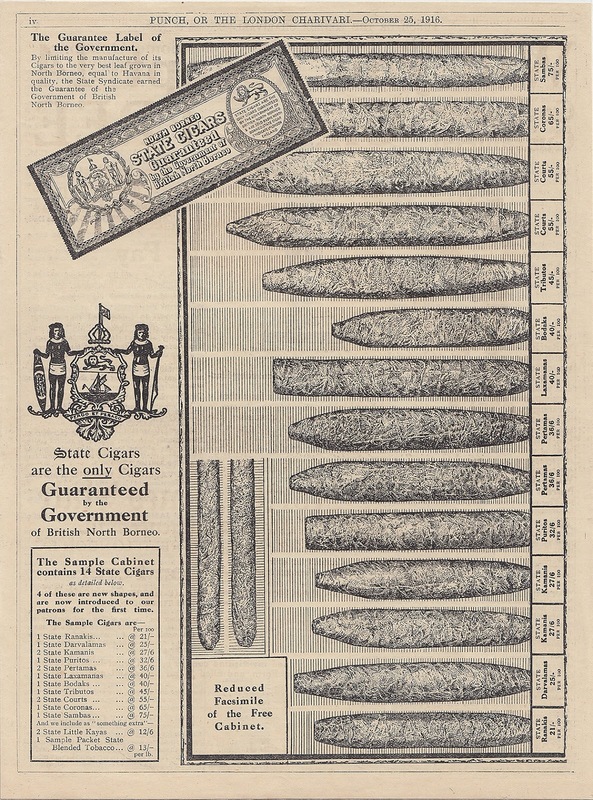 This is despite the fact that tobacco for pipe use came earlier than cigars and cigarettes. The bottom of the card advertised the various brands for pipe smoking. 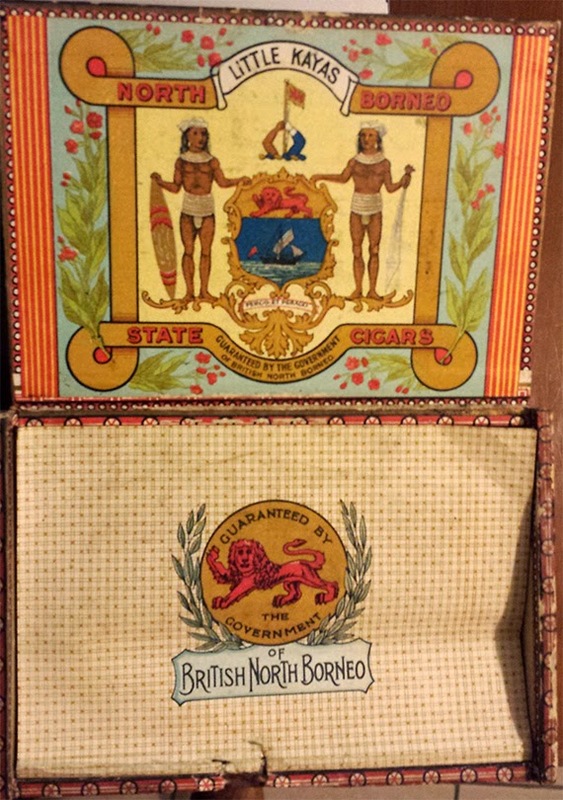 A cigar box from the state cigar company. Each box can hold 50 small cigars. The box was probably from the early 20th century. 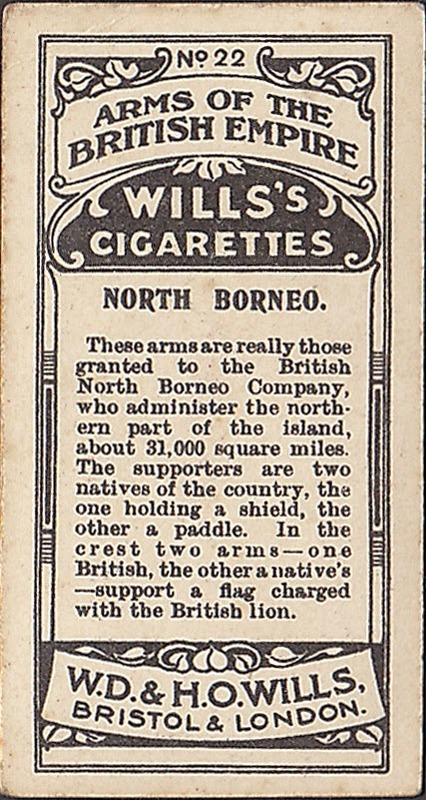 An advertisement in Punch of the various types of cigars available which were guaranteed by the Government of North Borneo. 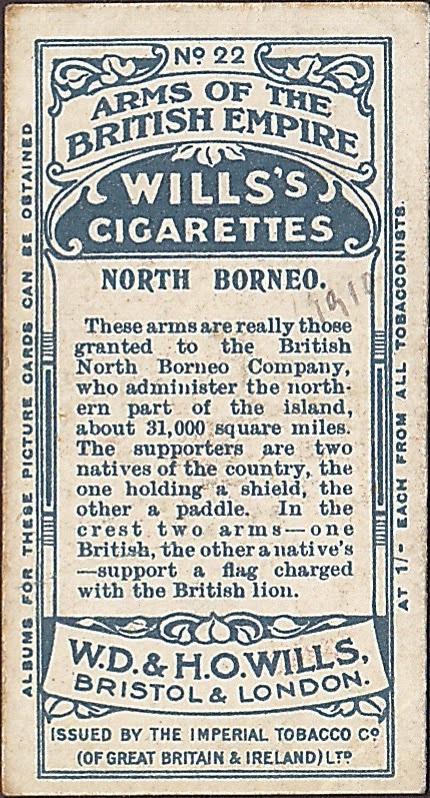 The tobacco grown in North Borneo was used mainly as wrapper leaf and so what was inside the cigar was probably sourced elsewhere. You can see part 1 by clicking here. I have expanded my collection of similar material over time. 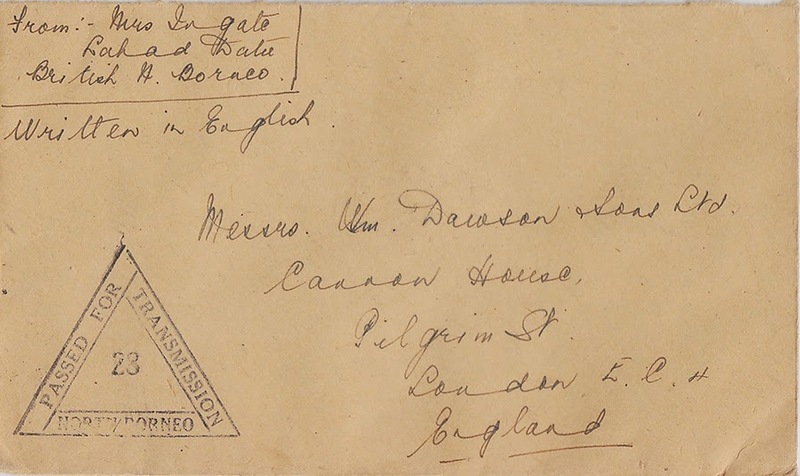 I now have items from Brunei, Labuan and Sarawak which I can show at a later date. 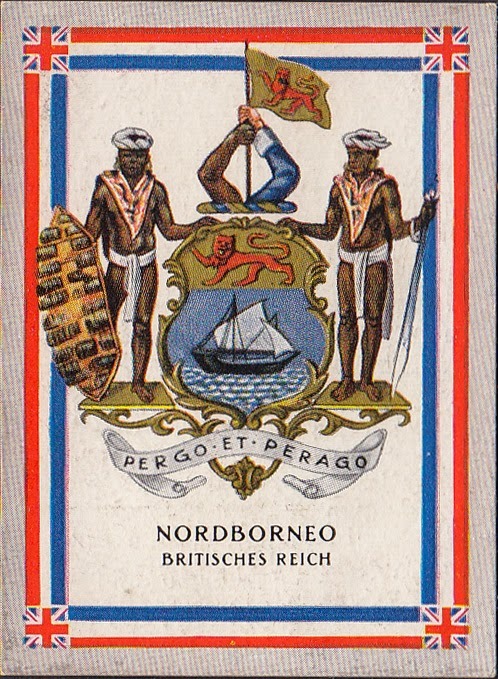 Additionally, I also have similar cards from the Malayan states which I may well include subsequently. This is the second card from Aurelia from Dresden in Germany. It is number 193 of the series and depicted the Olympic banner for the 1936 Berlin Olympics. These partly embossed cards are very attractive and collectible. 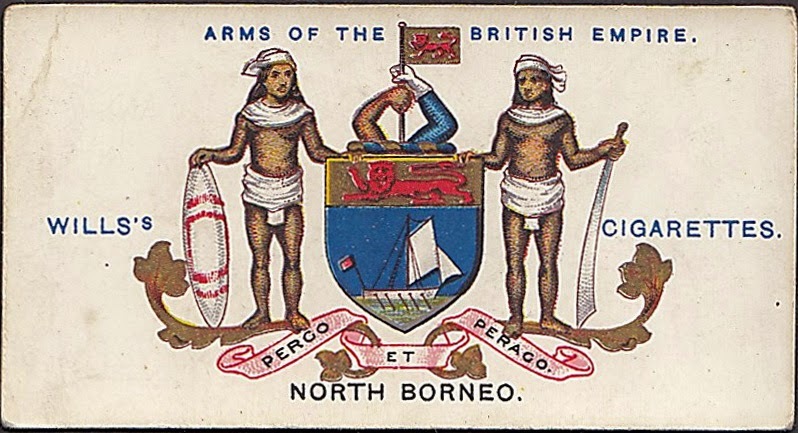 I also have similar cards from Brunei, Sarawak and the Malayan States but none from Labuan. 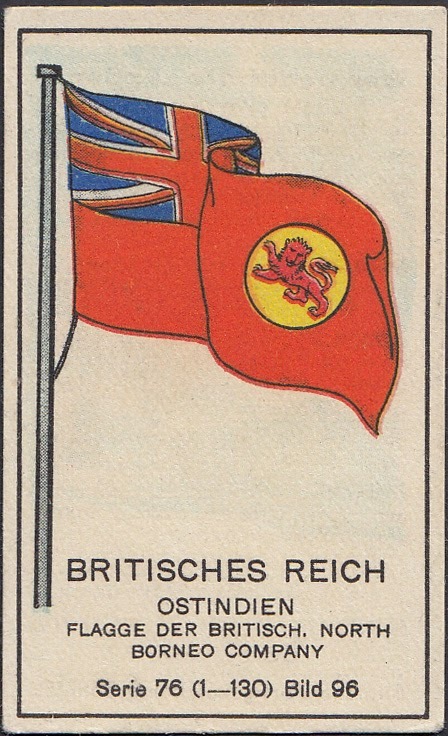 This card is also from the York brand of cigarettes in Germany. It is number 112 in the series. There is very little other information available. This card was enclosed with Recruit Little Cigars manufactured by H Ellis & Co, Baltimore, USA. 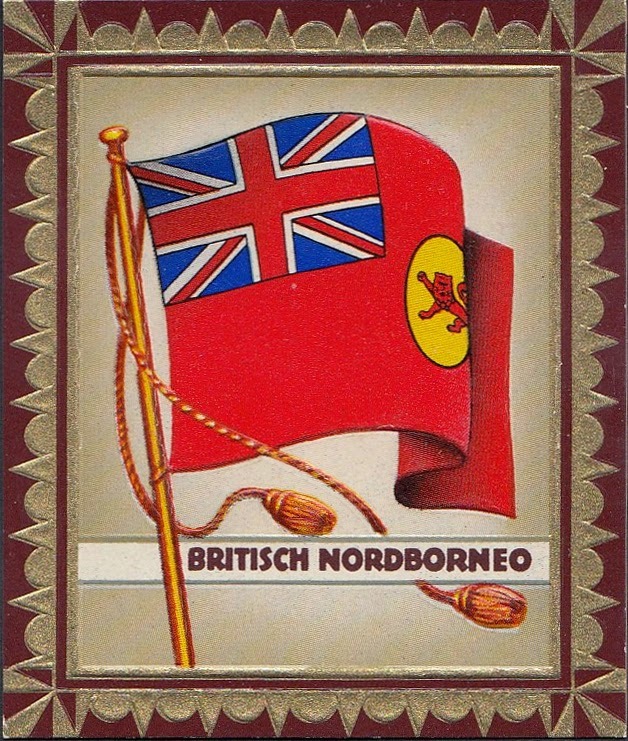 An issue showing flags came out around 1910. 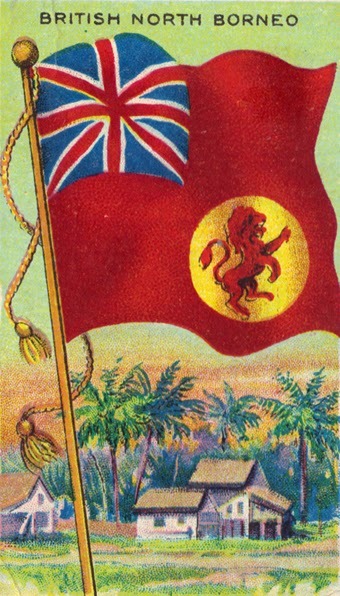 The flag shown is definitely incorrect as the lion should be facing left instead of right. This is a rather basic design from the Massary company in Berlin Germany apparently published in 1929. This is a large silk from the 10th series from Godfrey Philips BDV cigarettes, a British company. They were issued somewhere between 1910 and 1914. Silks are nice to look at but they are fragile and not easy to handle. The 20th series of silks from BDV has the wrong version of the BNB flag with the lion facing the wrong way. Mail were censored from some time in 1939 with the war in Europe. 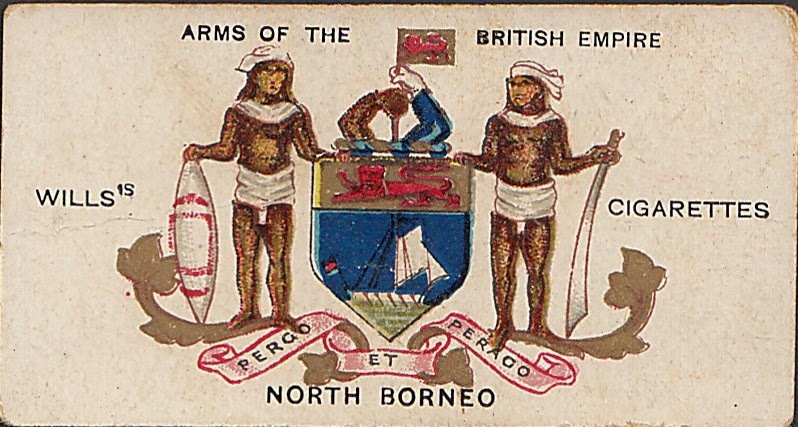 In North Borneo, the major post offices had their own censor hand stamps which were identified by a number. Most had multiple hand stamps with different corresponding numbers. These were either double line triangular or single line rectangular with 2 of each type recorded so far. Apparently, the censoring was carried out by wives of expatriates working there. When a letter passed through censoring it maybe unopened. Opened mail would be resealed with official tape. Censored postcards are uncommon in my experience. 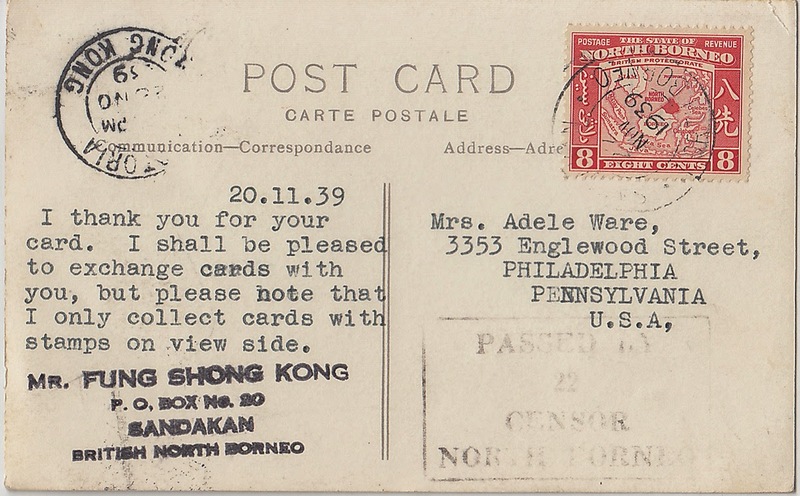 This was sent from Sandakan and bears the rectangular censor cachet number 22. 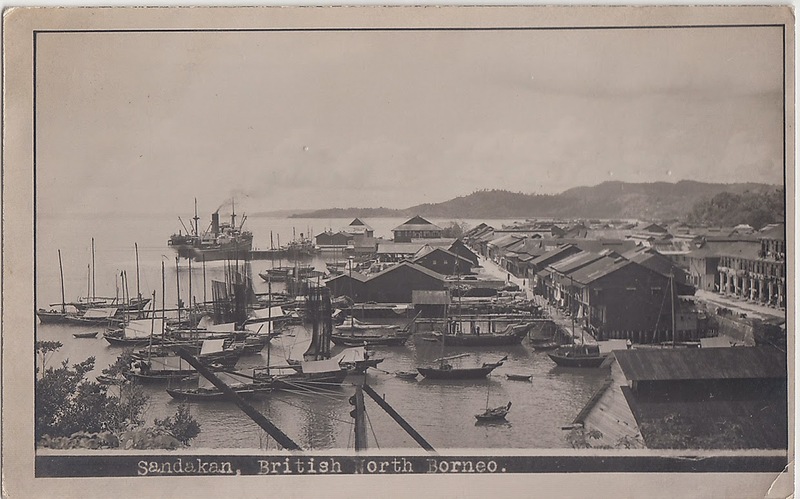 The known censor numbers for Sandakan were 10, 15-20, 22, 23 and 30 with both double triangular and rectangular cachets for most of them. The post card shows a very nice view of part of the centre of the town and the harbour. Censor mail from Lahad Datu and Tawau are generally uncommon. Lahad Datu has the censor numbers 28 and 29. The censor hand stamp for number 28 is usually seen as a rectangle and this double triangular form is much more uncommon. Originally from Sandakan, I have collected NB intermitently since chilhood but assembled the main part of my collection since arriving in the UK in 1975. I have always been fascinated by the use of 3 different written languages on a lot of NB stamps. Together with Labuan, this must be unique. I shall update my posts from time to time as I get further information. This is an evolving animal. I hope this blog is of some interest to everyone. I would like to aim some posts toward the novice in the hope that I could stir some interest in young Sabahans in this aspect of our history and culture. On the other hand, if my enthusiasm gets the better of me, my apologies for rambling on. This is a middling collection which is still growing but should be achievable by most with time and dedication. Pergo et Perago "I proceed I strive and I accomplish". Any original images and information here should only used with permission and this source acknowledged. There is still a certain etiquette in this day and age.